Last week brought a cluster of environmental news, and this popped yesterday, and doesn’t bode well in the culminating future. Levels of carbon dioxide in the atmosphere “exploded” last year to reach a new record high not seen for thousands of years, scientists have announced. The last time there was such a sustained increase in carbon dioxide concentrations was at the end of the last Ice Age, between 17,000 and 11,000 years ago. But the current increase is now about 200 times faster than then, they said. Instruments monitoring CO2 levels at the Mauna Loa Observatory in Hawaii recorded a jump of 3.05 parts per million (ppm) during 2015, which is the largest year-on-year increase in 56 years of research at the site, according to the US National Oceanic and Atmospheric Administration (NOAA). 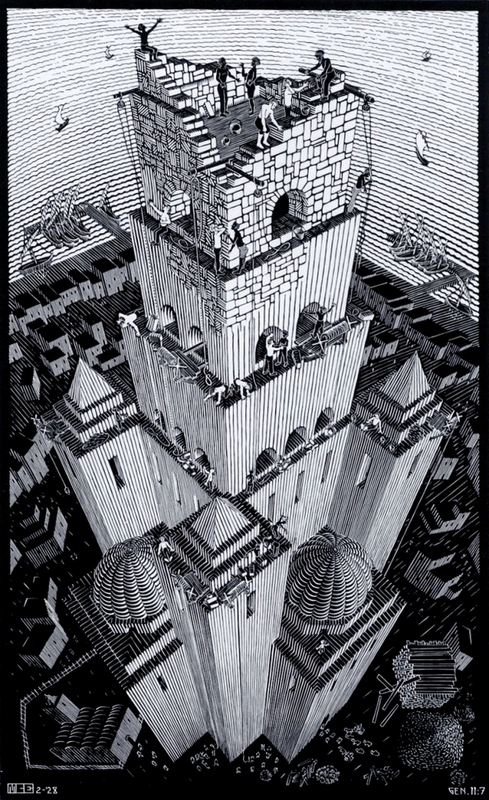 (Illustration: M.C.Escher’s ‘Tower of Babel,’ found here). Michael Mann, an atmospheric science professor and director of the Earth System Science Center at Penn State University, who is unaffiliated with NOAA, said the carbon dioxide milestone shouldn’t be over-interpreted. “This spike is almost certainly due in substantial part to the ongoing El Niño event, which is a fleeting effect that increases carbon dioxide concentrations temporarily,” Mann said. Emissions, he said, have stabilized somewhat in recent years and dropped slightly in 2015, reflecting human progress in transitioning away from a fossil fuel economy, he said. “Those are the numbers to keep a close eye on,” he said.